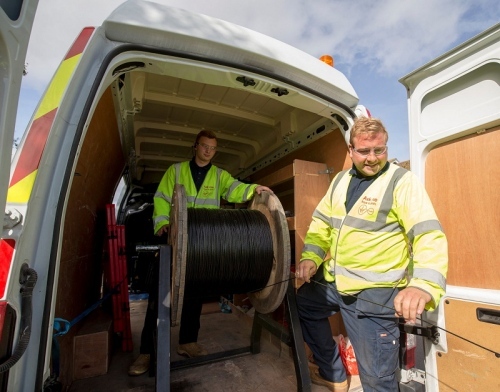 Cable operator Virgin Media has announced that they’ve completed a major extension of their ultrafast 350Mbps cable broadband ISP and TV network in Bangor (Northern Ireland), which began last year and can now reach an additional 24,000 premises. The deployment forms part of the provider’s commitment to cover an additional 50,000 homes and businesses in Northern Ireland, which was made last August 2017 (here). At the time the roll-out had already started in Ballykelly, Bangor, Limavady, Newtownards, Strabane and Artigarvan. As usual this forms part of their wider £3bn Project Lightning programme, which is working to reach an additional 4 million premises by 2019 or 2020 and this should extend their network coverage to around 60%+ of UK premises. Roughly half of this work is forecast to use FTTP and the rest will be Hybrid Fibre Coax (both via EuroDOCSIS). Now back to normality. Following posts will no doubt be from a regular individual with rants about VM evil, VM congestion….. Blah Blah Blah. I would second the congrats for delivering something. I’d be amazed if the pure fibre part of the network suffered from congestion unless something really silly is being done. c) fibre to a cabinet, daisy chained to a number of other cabinets by coax and then split from there to homes. I’d be amazed if type (a) setups suffered from much speed variation. I’d would be surprised if type (b) setups suffered from great speed variation. I’d be unsurprised if type (c) installations suffered from all sorts of random stuff as they are limited by the backbone coax and state of the copper. Really VM should be a bit more honest with consumers as to what they can deliver over each network architecture and then the ranty comments which would mostly be about the legacy type (c), I would guess, fade away. So I suppose VM shouldn’t really try and sell the high bandwidth packages on the type (c) estate. But still well done VM for connecting people to something better than a twisted pair: it is all good progress. VM do not suffer from any mass problem no matter if its FTTP or DOCSIS. Like any provider and any service you can obviously get varying issues to some people (usually a very small amount of customers)… Some just do not mentally comprehend that on this website. So those thousands of posts on VM’s forum are all imagined and don’t exist then? The internet is full of people complaining about VM. Not sure why you’re always rude to people who disagree with you. I purposely had VM as a comparator during 2017. Line speed was consistent and at the time I had Vivid 200 for the price of a Vivid 100 TV package. However there was buffering at peak periods. We need better methods of monitoring ISP service and this will apply to FTTP where the broadband line will no longer be the issue. Im not disagreeing at all in fact you have just agreed with me…..
VM have over 5 million users. Your “thousands of posts on VM’s forum” are thus as i stated a “very small amount of customers”. ‘Thousands’ out of ‘Millions’ is not a ‘large amount’. Even if there were 50,000 complaints on Virgins forums about the product (which there is not) that would not even equal 1% of users if they have over 5 Million users. Customer growth and churn has nothing to do with your point about service quality. But if you insist. BT, Virgin, Sky and Talk Talk (the biggest 4) all since 2012 have only grown to the tune of approx 1-2 Million customers at best. The exception is Talk Talk who have remained pretty much stagnant at around 4 Million users. (4 Million in 2012 and 4.2 Million now). BT has grown by about 1.5 Million users (that figure though includes their EE acquisition which is a significant part of that increase. Near to 1 Million in fact as that was the figure of users EE/Orange had in 2012). Sky has grown by about 2 Million, and that is probably more in part down to increased TV options and being able to buy a phone service/line from them which you could not in 2012, combined with their NOWTV platform which you can start on for less than 20 quid and its clear where the majority of their increases are from. Virgin in 2012 actually had nearer 4.3 Million customers, today it is around 5.2 Million, they have not bought up their own Mobile division and so a near 1 Million increase puts them somewhere in the middle growth wise for the Top 4 and no significantly better or worse than the others. If you want to talk growth and who is best then Vodafone percentage wise have probably done the best in the UK. based on this sites figures in 2012 they were not even in the Top 10 subs figures for users. In 2014 they made it to number 9 with a grand total of just 75,000 users (Demon and C&W acquisition was the reason for that) Today in 2018 they have 382,000 Customers a growth of over 300% since 2014. This is all far too complicated maths for you though (Obviously) and like the above poster i look forward to more ill informed opinion from you. NO what he actually states is “working to reach an additional 4 million premises by 2019 or 2020” The key word being “reach”. Reaching premises has nothing to do with number of customers who take your service. Virgin is currently available to around 50% of the country, which would mean they “reach” around 15 Million premises, of those 15 Million homes the service is capable of reaching around 5 Million are actually customers. This equates roughly to a 33% sign up rate. Anything which is or is not coming in 2019/2020 From Virgin or anyone else has bugger all to do with how many customers they have either now or in the future. Unless they have a time machine and can leap forward to see how many will take their product in 2 years time. BT can “reach” near to 100% of the country, which would be near to 30 Million premises and can supply at minimum a phone line to most of those which they can ‘reach’. However they have only 9 Million customers, or if you want that is around (to be generous) a 33% actual customer take/sign up. Which shock of shock is about the same as Virgin availability numbers VS take up numbers. I trust and hope further explanation has helped you. Being one of the top/mainstream ISP’s they will gather their own fair share of retards who will complain when the fault is likely there own doing or created as a result of their own ignorance. If you feel i am the one who must be multiple people and all i am going to do is harass you then please feel free not to respond to anything i have to say. Are you going anywhere nice on holiday this year? Thank you for asking i have already been and had a wonderful time. I hope any holiday you have this year is also enjoyable. NO ISP promises to deliver the top speeds to anyone. But in the case of virgin they actually do better than many with the VIVID 350Mb product on average delivers 362Mb. Please contact thinkbroadband with your expert opinion on why their data is wrong. They could have added another 2000 premises to the Bangor N.I total if they had expanded the range to cover a semi rural village, the last VM DP box is only 800 meters away. I suppose it depends on the work needed from that last cabinet to the premises they have missed served by that cabinet as to if they would get connected. Perhaps there was some wayleave that got in the way. Might be worth contacting them to ask.